The Tapping Solution Foundation has been providing support for The Choose Love Movement and is proud to contribute to The Jesse Lewis Choose Love Enrichment Program which is a social and emotional (SEL) classroom program teaching children how to choose love in any circumstance. The program focuses on four important character values – courage, gratitude, forgiveness and compassion – which cultivates optimism, resilience and personal responsibility. 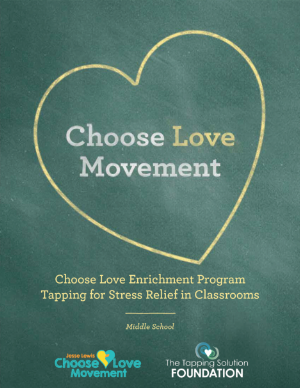 The Tapping Solution Foundation has created a Tapping extension to guide teachers in implementing Tapping in the classroom alongside the Choose Love Enrichment Program lessons. The Tapping extension is written by Alison Partridge, TTSF Director of Program Development and co-author with Nick Ortner, of The Big Book of Hugs. With Tapping for Stress Relief in Classrooms, teachers and students will learn how to use this self-regulating tool to develop an understanding of their emotions and a resiliency to take part in controlling them. The lessons are connected to the Choose Love Enrichment Program and can be taught within each of the four units: Courage, Gratitude, Forgiveness, and Compassion in Action. This program was developed, by educators for educators, to ensure you have the tools and resources you need to teach all essential life skills. The Tapping for Stress Relief in Classrooms Extension program will give teachers the knowledge and language to use Tapping in the classroom. 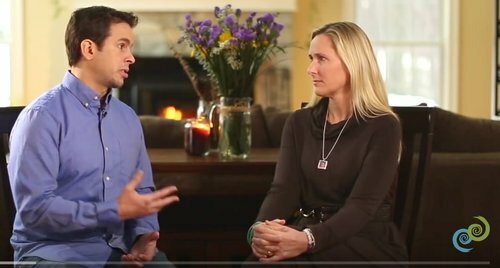 Nick Ortner, Newtown resident, worked one-on-one with Scarlett Lewis, mother of Jesse Lewis, to help her deal with the unimaginable trauma of the Sandy Hook tragedy.